I had the good fortune of coming across A TOUGH NUT TO KILL by Elizabeth Lee a few weeks ago. This is the first in her Nut House Mystery series with a total of three books now. The protagonist, Lindy Blanchard, has returned to her hometown of Riverville, Texas after receiving a degree in plant biology and bio-engineering. Lindy is devoted to developing a strain of pecan trees that are drought resistant along with helping her grandmother, Miss Amelia, run the Nut House. The Nut House shop is the family store that sells their farm’s pecans along with pecan confections and Miss Amelia’s famous pecan pie. It doesn’t take long for trouble to find Lindy and Miss Amelia. Someone has been snooping around Lindy’s office and computer and then her Uncle Amos waltzes back into their lives. Amos is the “black sheep” and caused Lindy and her family great distress when her father was killed in a farming accident. Some people are sure it was Amos who killed her father and when Amos disappeared right after the funeral, everyone breathed a sigh of relief. But before they can find out why Amos is in town, Lindy trips over his murdered body lying amongst her destroyed pecan trees. To make matters worse, five of her most promising bio-engineered trees have been stolen. When the local law enforcement arrest Lindy’s brother, Justin, for the murder, Lindy and Miss Amelia realize they must find the killer and tree thief before he or she kills again. I loved the Texan small town setting in this book. My father was born and raised in Texas and every two years our family made the long drive from California to Texas to visit family. Elizabeth Lee has captured the Texans’ hospitality and graciousness that I have fond memories of in her cast of characters. She also humorously portrays the small town rivalry between Miss Amelia and her friends. 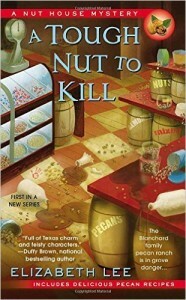 In addition to a good story the author has also included several pecan-themed recipes. I had a hard time choosing which one to try out (they all sounded so yummy!) but in the end it had to be Miss Amelia’s Special Pecan Pie which uses bourbon in the filling. 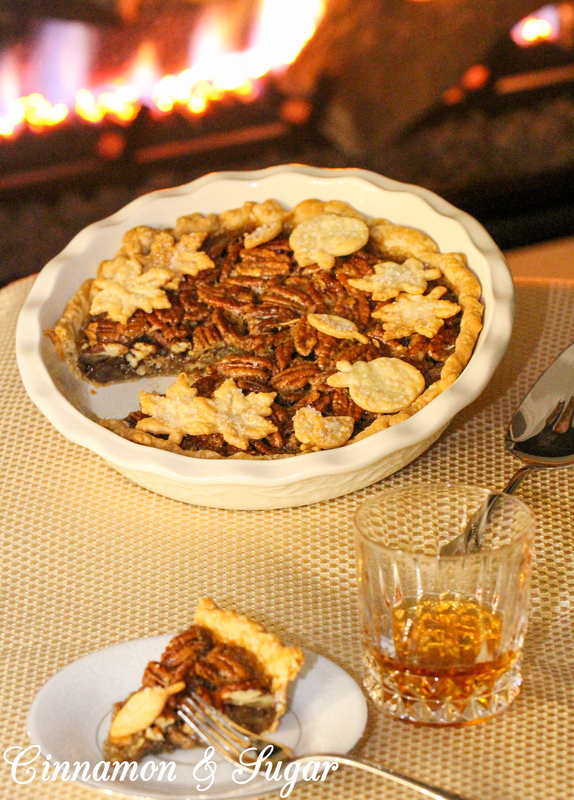 There is something magical that exists when bourbon is paired with crunchy, buttery pecans and this has become my new favorite pecan pie recipe for both Thanksgiving and Christmas! Of course if bourbon and/or alcohol doesn’t appeal to you, by all means leave it out. The pie will still be superb! 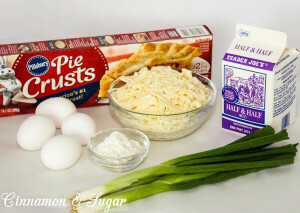 Be sure to scroll to the end of this post to view a video tutorial on how to make this amazing pie. A special thanks to Elizabeth Lee and her culinary consultant, Patty Sumpter, for allowing me to share this very delicious recipe with you! 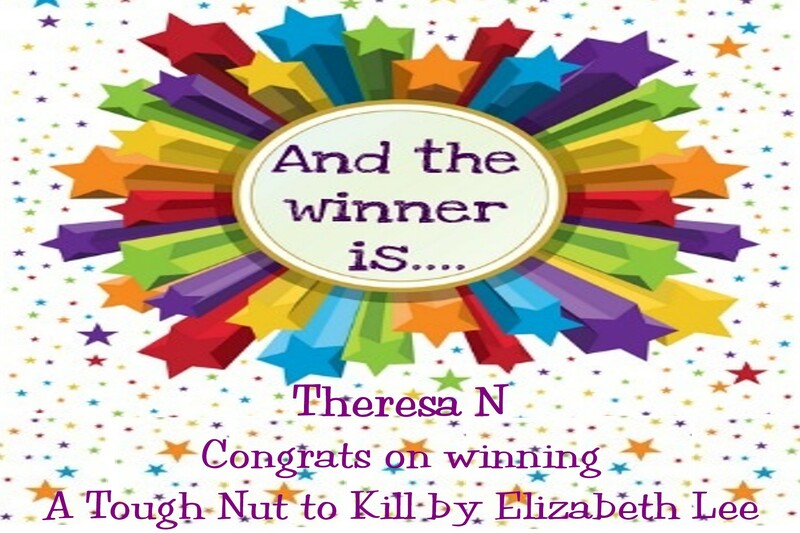 And a huge thank you to Elizabeth for providing an autographed copy of A TOUGH NUT TO KILL to one lucky winner! Please comment below to be entered. Contest ends Wednesday, November 25, 2015 at 11:59 pm PST. Winner will be announced on this page and on Cinnamon & Sugar’s Facebook page, as well as notified by email (so check your spam folder!) and will have 6 days to respond or another winner will be chosen. Best wishes to everyone for a wonderful Thanksgiving holiday! Aside from posting the winner of A TOUGH NUT TO KILL, I will be taking the rest of the week off to enjoy the holiday and will resume with a new recipe and review December 1st. Miss Amelia Hastings of the Nut House always puts at least a dash of Garrison Brothers Texas Straight Bourbon Whiskey in her recipes because she thinks Garrison Brothers brings tears to the eyes of a real Texan. You can use any bourbon that reminds you of home. Or leave out the whiskey entirely. 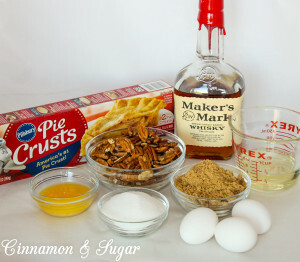 Or if you’re having a really bad day, leave out the rest of the ingredients and just drink the bourbon. 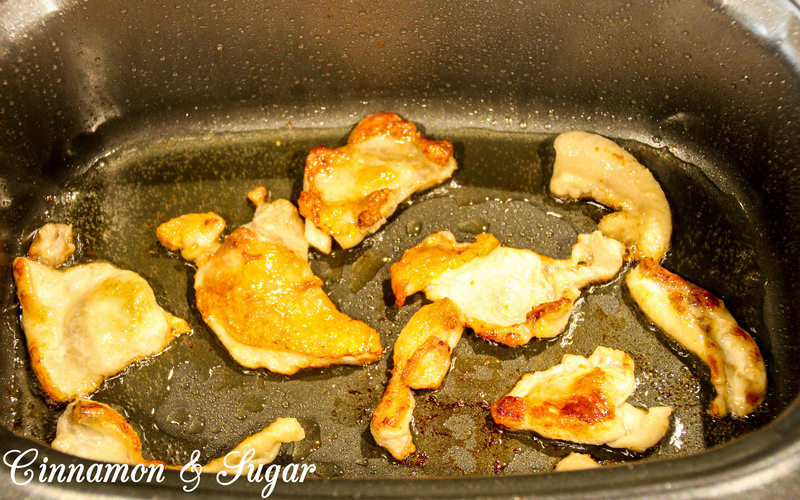 Mix the white sugar, brown sugar and melted butter together. Stir in the Karo syrup, eggs, and bourbon. Bake in the preheated over for 10 minutes. Reduce the heat to 350 degrees (F) and bake until the pie is set in the middle – about 35 minutes more. The internal temperature should read 185 – 190 degrees (F) if you use an instant read thermometer. You can also use a knife to test if the center is pretty well set. Serve with a side of pecan ice cream or a shot of bourbon. You can use extra pie dough to cut out festive shapes. 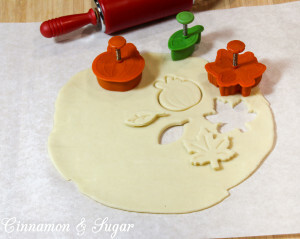 I like these plunger type cutters but regular mini cookie cutters will work as well. 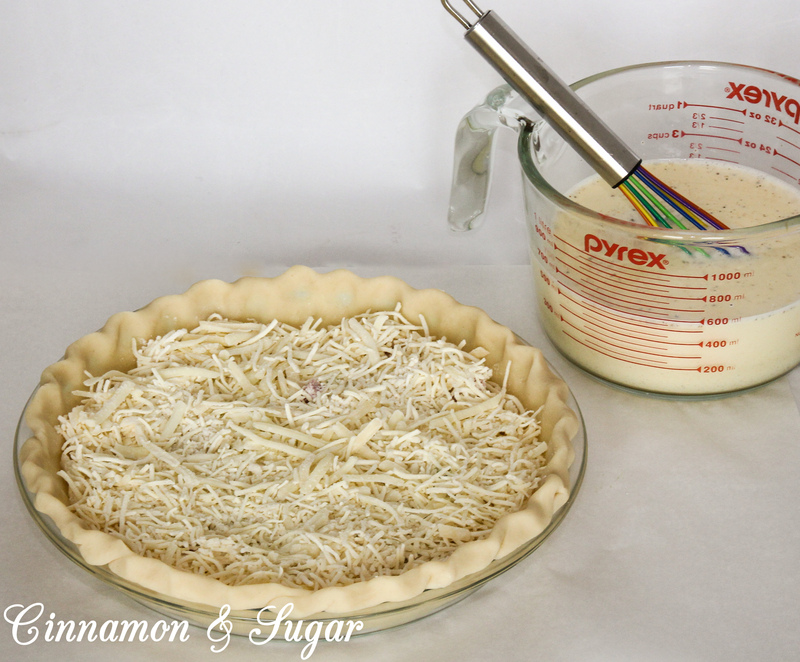 Cut out the pie dough then brush with a bit of water. Sprinkle with coarse sparkling sugar and bake for 10 – 12 minutes or until golden brown in a 350 degree (F) oven. Spritz the pie plate with non-stick cooking spray before adding the pie crust. 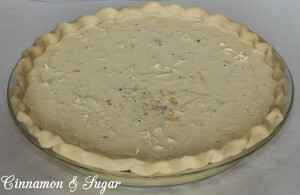 This will allow you to easily slice and remove slices of pie should the sticky syrup filling bubble over and adhere the crust to the pie plate. I tried to find Garrison Brothers Texas Straight Bourbon but couldn’t locate any in Southern California. I substituted Maker’s Mark with great results! If you subscribe to receive this post via email, you will need to visit my website to view the video tutorial. With Thanksgiving right around the corner, thoughts turn towards finalizing menus in order to plan grocery shopping and figure out cooking and baking timelines. 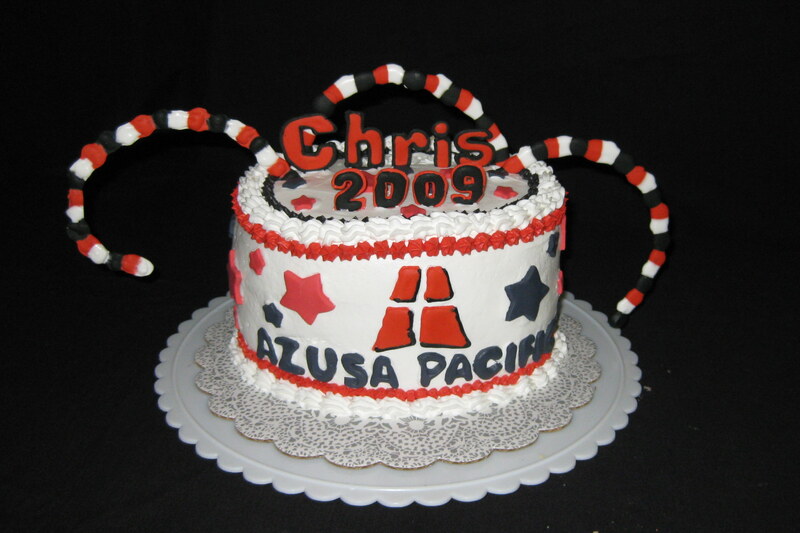 While pies are favorites in my household, I have had guests who prefer cake. And since my husband can’t have dairy products (and we have a few friends who are vegan) I decided many years ago to give vegan pumpkin cake a try. 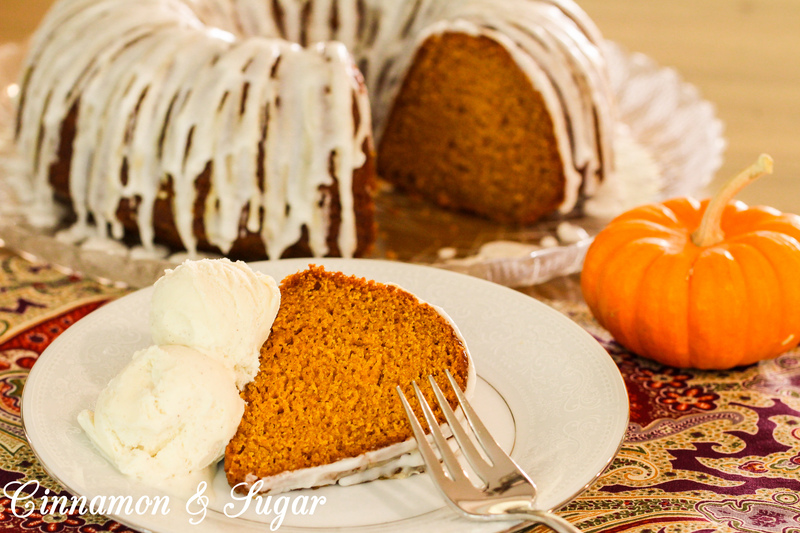 Oh my… once I tried this I stopped looking for any other pumpkin cake recipes! Supremely moist and flavorful thanks to the warming Thanksgiving spices, this cake mixes up super quick and since it doesn’t have eggs, the kids can safely lick the beaters afterwards. 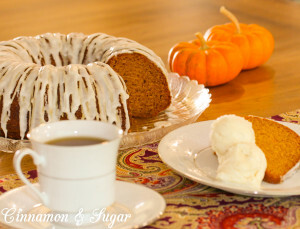 An easy icing drizzle and it’s company worthy and no one will ever suspect this Vegan Pumpkin Spice Cake doesn’t have eggs or dairy. In addition to its deliciousness, this cake can be made a day or two in advance, freeing up the oven for the rest of your meal. Sending best wishes to everyone for a wonderful Thanksgiving celebration! Spray a 10-inch Bundt pan with non-stick cooking spray with flour (such as PAM). 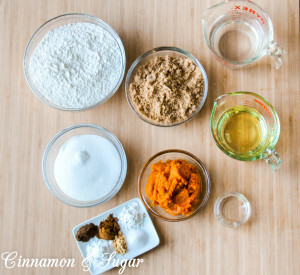 Whisk the flour, granulated and brown sugars, baking powder, baking soda, salt, cinnamon, ginger and allspice together in a large bowl. Set aside. In a smaller bowl, beat the water, pumpkin, vegetable oil and vinegar together until combined. 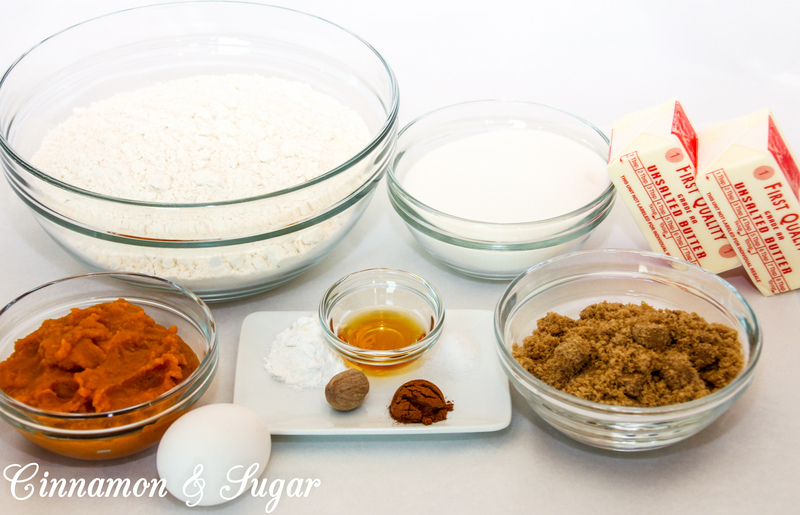 Pour the pumpkin mixture into the flour and sugar mixture. 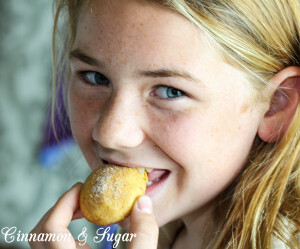 Using a hand-held electric mixer, beat the batter on medium speed until smooth. This will take approximately 2 minutes. 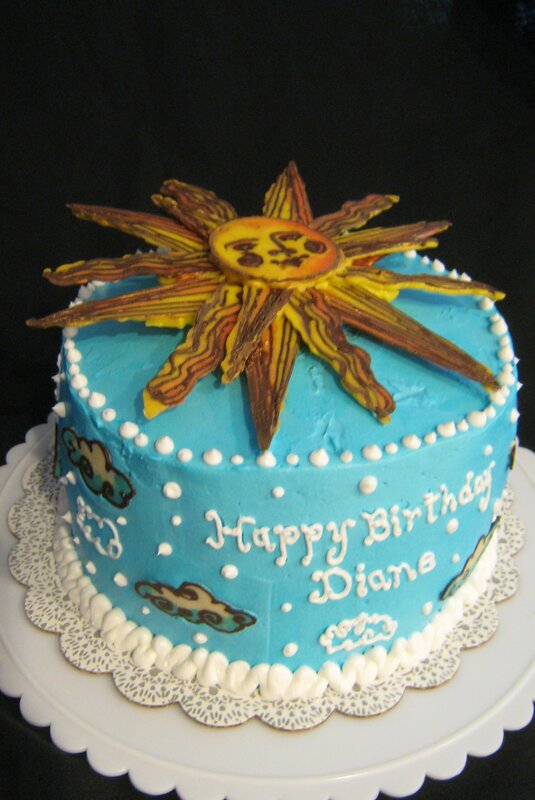 Bake 50 – 55 minutes or until a wooden skewer inserted into the center of the cake comes out clean. Remove from oven and allow the cake to cool in the Bundt pan for 10 minutes, then invert onto a serving pan. 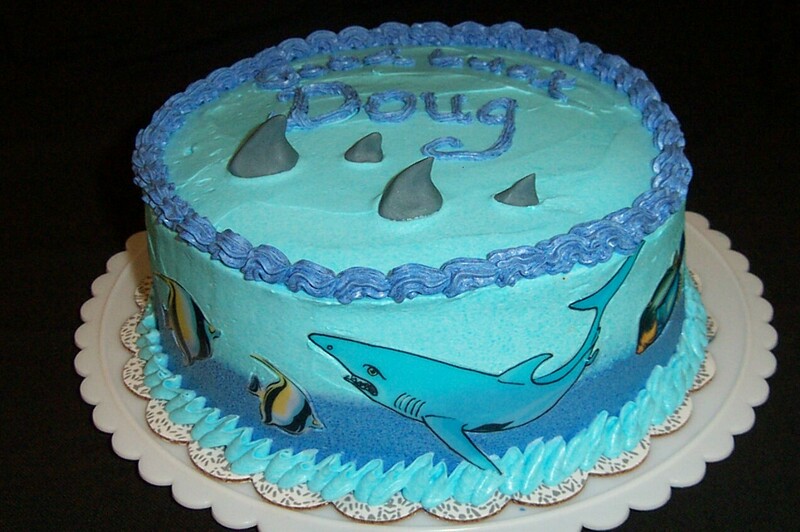 Allow the cake to cool to room temperature before drizzling the icing glaze over the top. 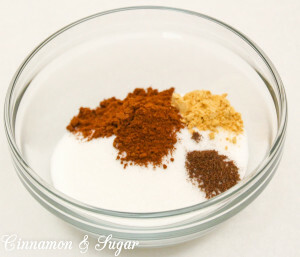 Add the confectioners’ sugar, non-dairy milk and vanilla extract to a small bowl. 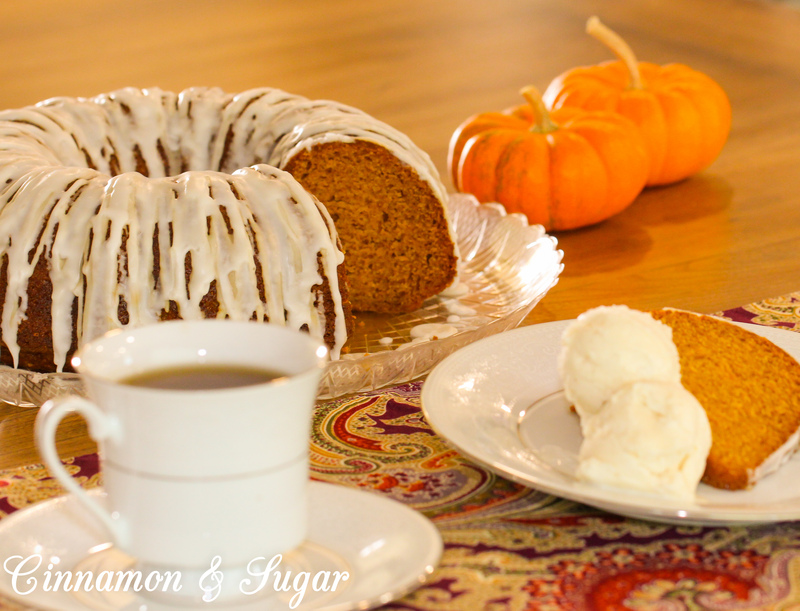 Drizzle over the cooled pumpkin spice cake and allow the icing to set at least 20 minutes before slicing and serving cake. 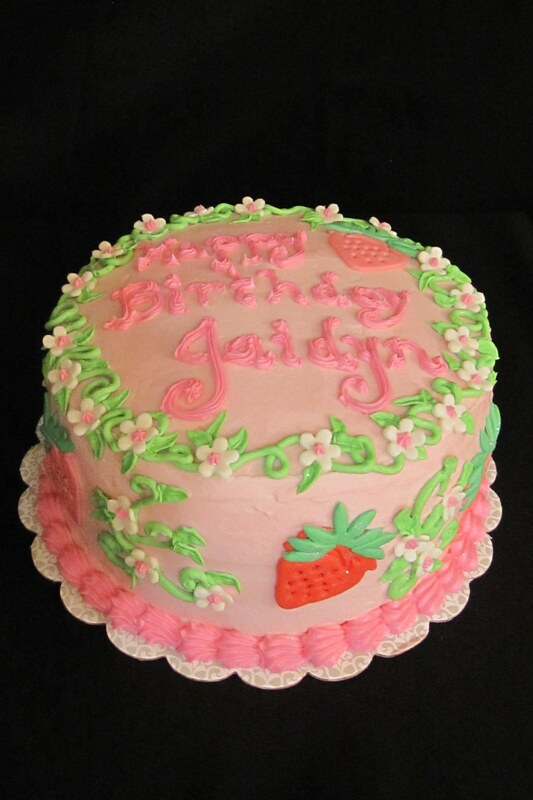 If you bake the cake a day or two ahead of time, do not add the icing glaze until a few hours before serving. If you receive this post via email you will need to visit my website to view video. I always associate the ensuing holidays with cranberries and pumpkins. Their jeweled tones bring colorful notes to the table, with cranberries bringing a wonderful tartness which provides a nice contrast to all kinds of dishes. 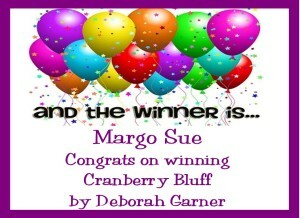 When I came across the book CRANBERRY BLUFF by Deborah Garner, I was smitten for many reasons! Her cover art makes me want to step in and visit this quaint Bed and Breakfast and then anything with cranberries is going to catch my attention. I was even more excited to find out as I browsed through the book that Deborah included Aunt Maggie’s Cranberry Cottage Cookbook, which contains 15 cranberry related recipes! Of course I would be remiss in not telling you that the author crafts a delightful cozy mystery that pulled me in from the very beginning and kept me guessing until the end…. 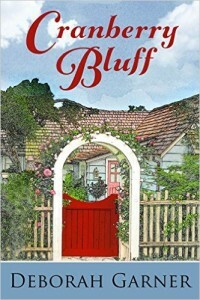 Molly Elliott has moved to coastal Northern California after inheriting Cranberry Cottage Bed and Breakfast from her Aunt Maggie. Molly is happy to have escaped Tallahassee, Florida where she was a suspect in a bank robbery after being in the wrong place at the wrong time. Plus it didn’t help that she looked very similar to one of the bank robbers. Even though she is cleared the media won’t leave her alone and she started receiving threatening notes. Moving clear across country couldn’t have come at a better time. Molly is settling into the routine of running her Bed and Breakfast. She carefully screens all guest reservation requests to make sure there are no connections to her former life in Florida. When five guests arrive, a newly-wed couple, a senior citizen who loves to shop and knit, a salesman, and a smooth-talking handsome man who claims to be working on his novel, things begin to go awry. Her guests all seem to be hiding something and then she finds out that the trouble she left back in Tallahassee has followed her to California. Someone wants the robbery money back and she’s left trying to prove her innocence all over again. One of the things Molly serves her guests for breakfast is cranberry scones. Tender, flaky pastry studded with tart sweet dried cranberries, these can be made ahead and then rewarmed and served with butter and your favorite jam. The perfect choice for a quick Thanksgiving breakfast while preparing your feast or for serving to your own overnight guests. 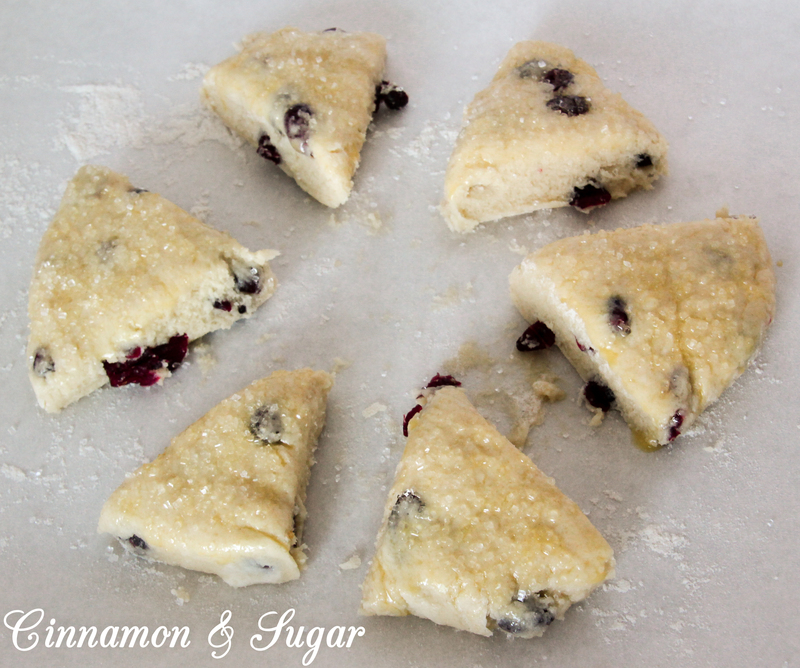 Be sure to scroll to the bottom of the page to view my video tutorial on how to make these Cranberry Scones. 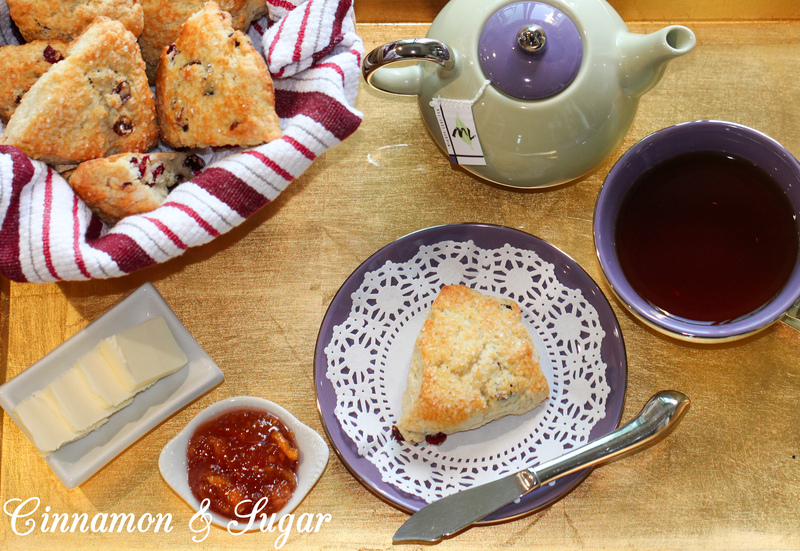 Thank you, Deborah, for allowing me to share your delectable recipe! 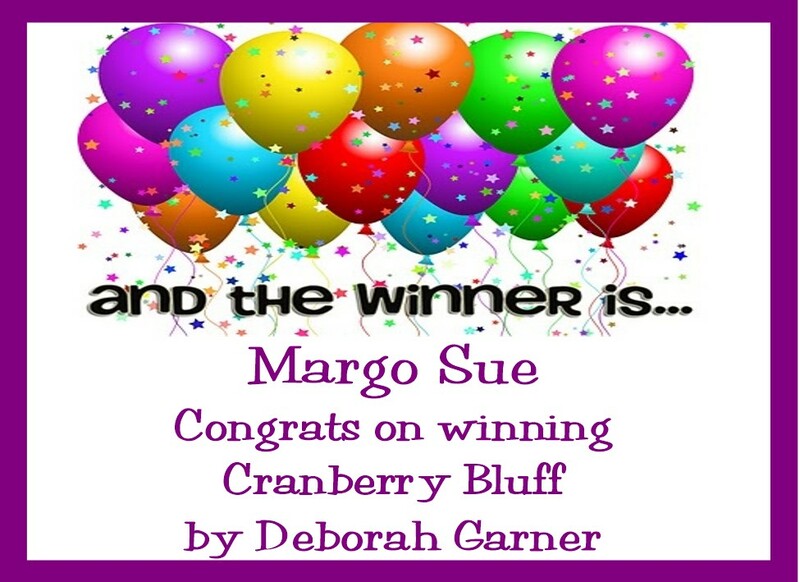 As a bonus for my readers I am offering a Kindle copy of CRANBERRY BLUFF by Deborah Garner. Please comment below to be entered. Contest ends Thursday, November 19, 2015 at 11:59 pm PST. Winner will be announced on this page and on Cinnamon & Sugar’s Facebook page, as well as notified by email (so check your spam folder!) and will have 5 days to respond or another winner will be chosen. In a small bowl, combine milk and 2 tablespoons of the beaten egg; add to crumb mixture just until moistened. Turn onto a floured surface and knead gently 6 – 8 times. Pat into a 6-inch circle. Separate wedges and place on a greased (or parchment-lined) baking sheet. Brush with remaining egg and sprinkle with coarse sugar. Bake at 425 degrees for approximately 12 minutes or until golden brown. Serve warm. If you subscribe to receive my post via email, you will need to visit my website to view video. Holidays are fast approaching which means family and friends gather together to celebrate. Most people have their traditional holiday dinners established but often when guests stay overnight it can be a struggle to decide what to fix for breakfast or brunch. 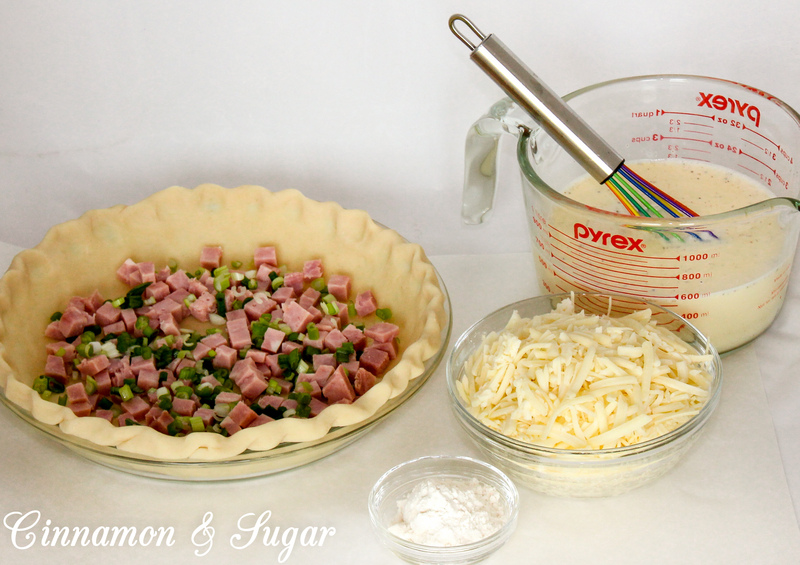 One of my “go-to” dishes is Ham & Gruyère Quiche. I can prep all the ingredients the night before along with a fruit salad and sometimes my Overnight Cinnamon Rolls. The next morning it takes only a moment or two to pull it together and pop it into the oven. While the quiche bakes I am free to serve coffee and/or mimosas to my guests and enjoy all the holidays have to offer without the stress of being stuck in the kitchen. 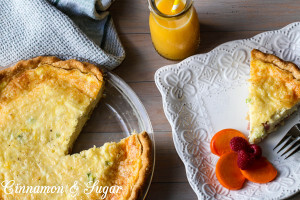 Our family also enjoys this for dinner served with a green salad and my crusty No-Knead Rustic Bread… and if there just happens to be leftovers, this quiche easily reheats in the microwave to make the perfect lunch the next day. Whisk the Half & Half, eggs, salt and pepper together. Sprinkle the chopped ham and sliced onions on the bottom of the unbaked pie crust. Toss the cheese with the all-purpose flour and sprinkle over the ham and onions. Pour the egg mixture over the cheese mixture. Bake in the preheated oven for 45 – 55 minutes. 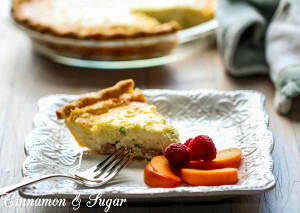 The center of the quiche should barely jiggle and an instant read thermometer should read 180 degrees when inserted into the middle of the dish. 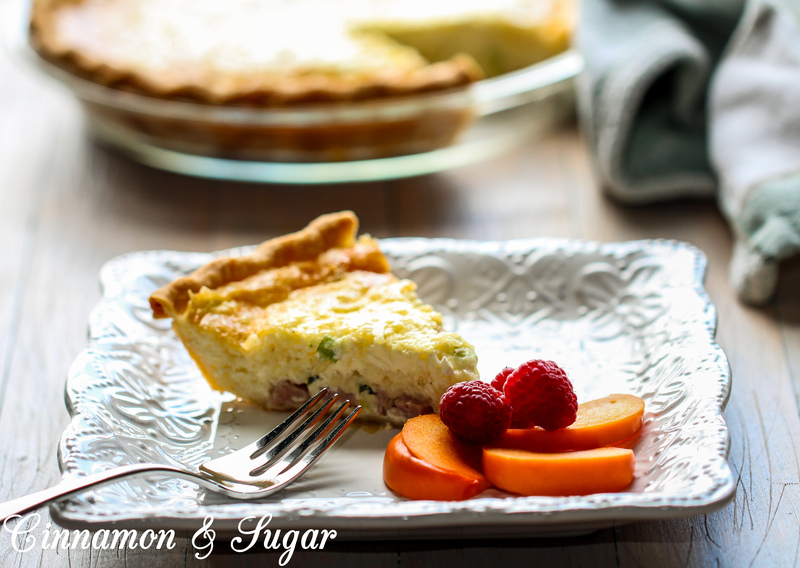 Allow the quiche to rest 10 – 15 minutes before slicing and serving. 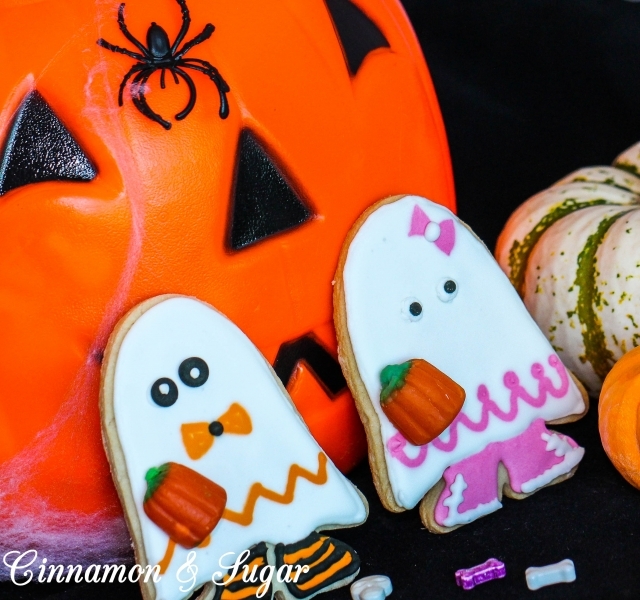 Between Halloween and Thanksgiving I begin browsing through cookie recipes, both new ones I’ve clipped and saved this year and old ones that have long been favorites. 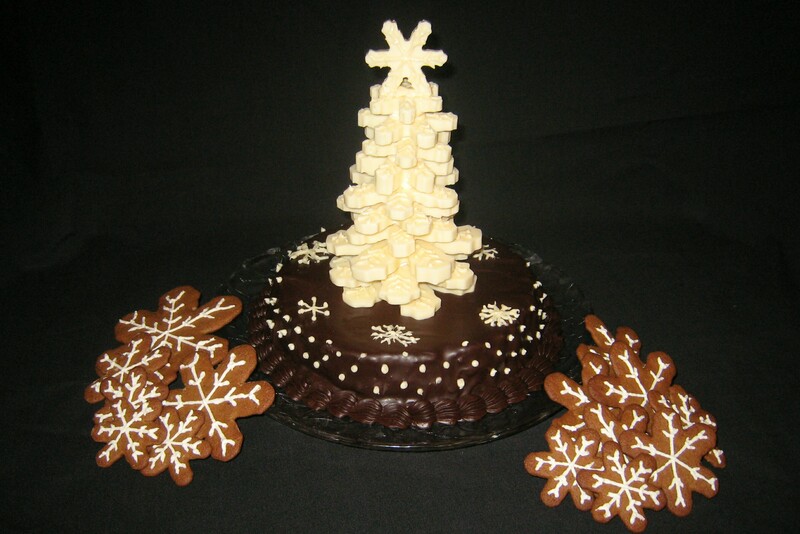 I then try to narrow down seven or eight recipes that will make the Christmas goodie bag cut and start baking. With my oldest granddaughter, Jaidyn, living with Rett Syndrome, there are so many incredible people giving their time, love and talent to provide her with care. 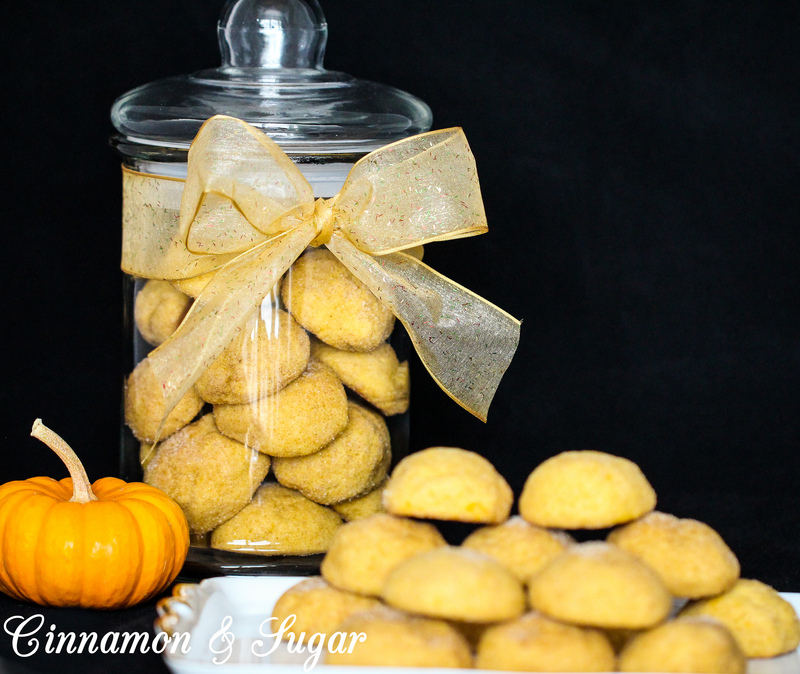 Homemade cookies are one of the ways we say thank you to each and every person. Naturally as I read books, magazines and “research” on Pinterest (okay, I’ll admit it…I find Pinterest very addicting and time consuming, so “research” sounds much better!) I’m always on the lookout for new cookies to try. I was very excited when I came across Zoe’s Pumpkin Snickerdoodles in the cozy mystery THE TROUBLE WITH TURKEYS by Kathi Daley. My youngest granddaughter and Jaidyn’s sister, Emory, also voted that these needed to be made. She also volunteered to be my video baker and sous chef (video tutorial at the bottom). 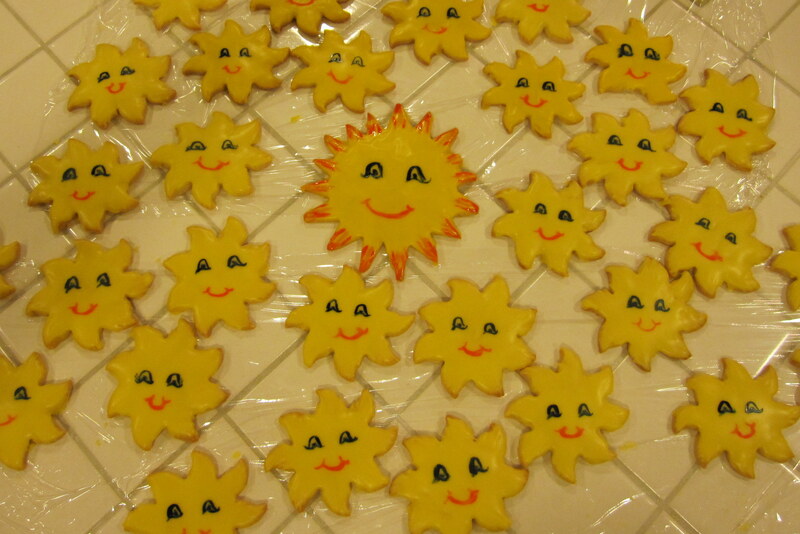 So thank you, Em, for baking these for all our friends and family! 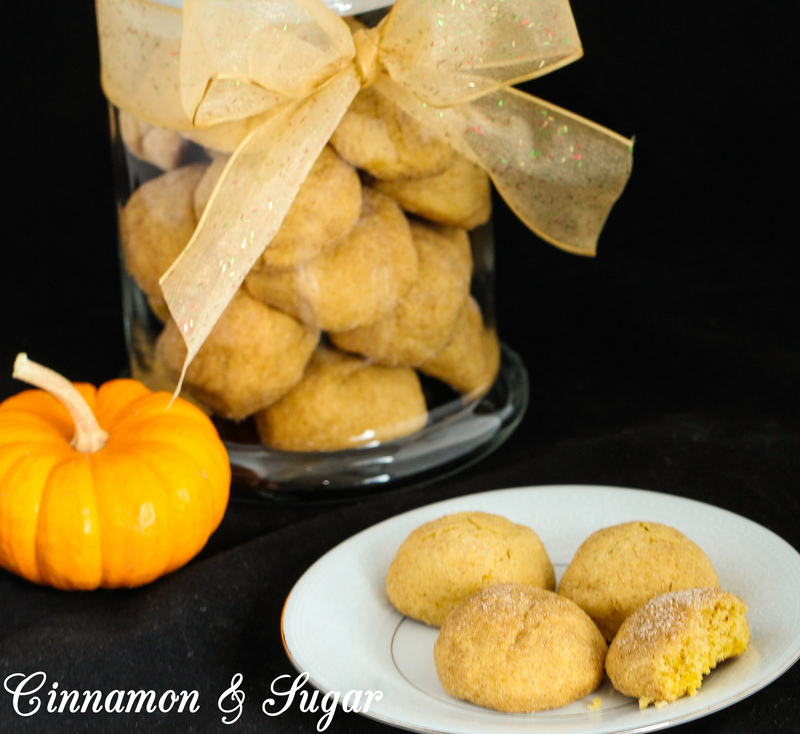 We loved Zoe’s Pumpkin Snickerdoodles which have a cake-like texture and the warm fall spices compliment the pumpkin perfectly. 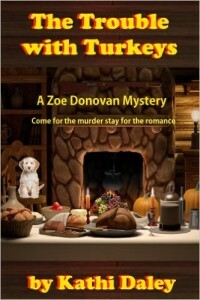 THE TROUBLE WITH TURKEYS is the second book in Kathi’s Zoe Donovan Mystery series. Two weeks before Thanksgiving, Zoe Donovan is depressed and hiding out in her alpine home after losing her job at Animal Control. Not only is she feeling sorry for herself but she’s also feeling guilty for getting her assistant, Jeremy, fired as well since he can’t afford to not have a job. Jeremy, however, doesn’t hold it against her and calls to offer her a temporary job helping him take care of turkeys. Not just a few turkeys but hundreds of heritage turkeys that are destined for Thanksgiving tables. She’d rather not, given the ultimate fate of the fowl, but takes the job anyway since Jeremy needs her help. At the farm they find out that the owner, Charles Tisdale, has died which is why temporary help is required. His family, waiting to see how the estate will be divided amongst themselves, are sure his death was from natural causes or maybe even an accident. But Zoe isn’t so sure and starts poking around, looking for answers. She finds that there are several people who had reasons to want Charles dead and when his long-time mistress is found murdered on the farm, Zoe starts looking for answers in earnest before someone else becomes a victim. On top of hunting for a killer, Zoe and Jeremy have their hands full taking care of tipsy turkeys and trying to figure out why the number of turkeys are fluctuating. Zoe’s long-ago antagonist from grade school, Zak, who is now a friend, gets involved in the hunt to find the murderer. As a result of spending time together and Zak being willing to help out however he can, Zoe finds that maybe there could be more than just friendship developing between them. This is the first book I’ve read by Kathi Daley and I was excited to see that she has many additional books in the series. I will be reading more to find out what happens to Zoe, Zak and Jeremy! 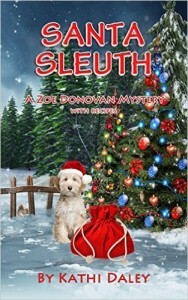 And for fans of Kathi Daley’s books, there is a brand new Zoe Donovan Mystery releasing December 1, 2015 titled SANTA SLEUTH, the 18th book in the series. I see I have quite a bit of reading to do to catch up on Zoe! As a bonus for my readers I am offering a Kindle copy of THE TROUBLE WITH TURKEYS or SANTA SLEUTH (available 12/1/15) by Kathi Daley. Please comment below for which book you’d like to win to be entered. Contest ends Thursday, November 12, 2015 at 11:59 pm PST. Winner will be announced on this page and on Cinnamon & Sugar’s Facebook page, as well as notified by email (so check your spam folder!) and will have 5 days to respond or another winner will be chosen. Thank you to Kathi Daley for allowing me to share Zoe’s delicious Pumpkin Snickerdoodles with you! 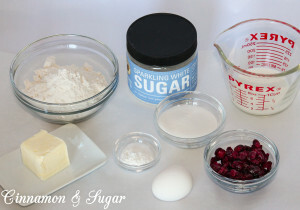 Whip together butter and sugars until creamy. Add pumpkin, egg, and vanilla. Mix well. In a separate bowl, whisk flour, baking powder, salt, cinnamon and nutmeg together. Add to the pumpkin mixture and mix well. In a separate bowl, mix the sugar and spices together. Roll chilled dough into one-inch balls. Roll in coating. Cool for a few minutes on the cookie sheet then remove to a wire rack to cool completely. If you subscribe to receive my post via email, you will need to go to my actual website to view video. The beginning of November is the signal that family holiday gatherings are right around the corner. Growing up, turkey always had the spotlight for our Thanksgiving table while at Christmas turkey shared the table with holiday ham. My mother would get up at the crack of dawn to stuff the turkey and get it into the oven so it would be done in time for an late lunch. We had lots of extended family close by so our huge turkey was shared and all families pitched in with side dishes and desserts. My mom and aunts all took turns hosting the gathering and roasting the turkey so that it didn’t become burdensome. Now days, most families are spread out all over the place so roasting a huge turkey for just a few of us seems like way more work and food than we could possible want or need. Plus, the turkey breast is the favored part of the poultry and I’m always left wondering what to do with the drumsticks and thighs. I was happy to discover that half turkey breasts are now readily available at several stores in my area and become prevalent in mid-October through the end of December. Still, I hated to heat up my oven to roast the breast on top of worrying that the meat would dry out before it was fully cooked. 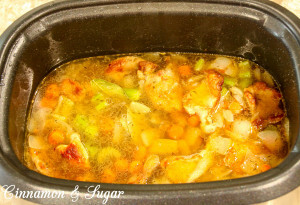 Enter the slow-cooker and my problems were solved! In addition to freeing up my oven for cooking side dishes and desserts, the half breasts cook relatively quick in the slow cooker: 1-1/2 to 2 hours! 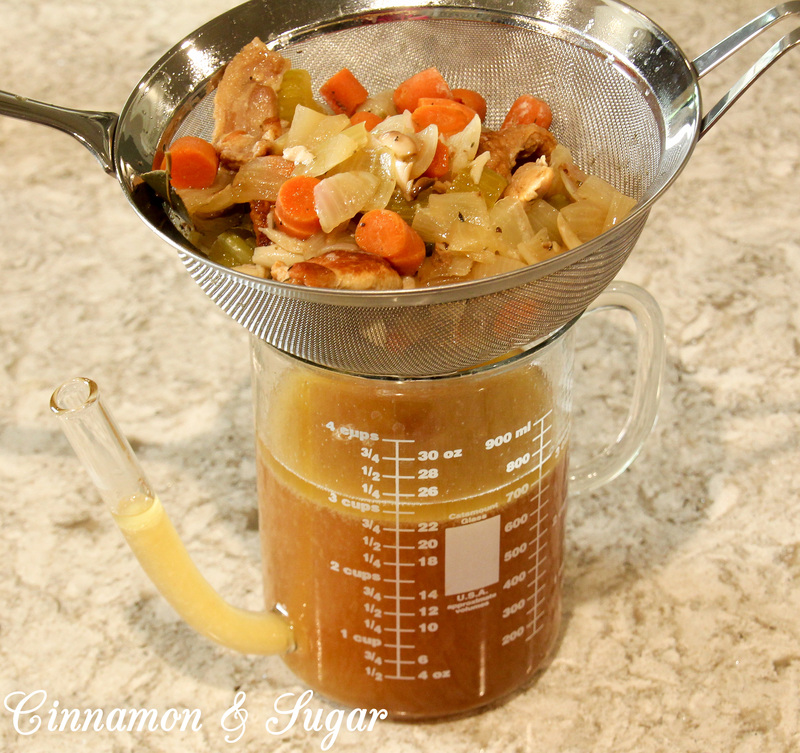 A bonus is that the braising liquid makes the most delicious gravy that is gluten-free so I can enjoy it as well. 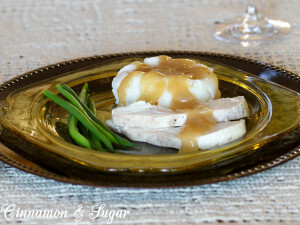 Succulent, moist turkey breast served with creamy mashed potatoes and drizzled with flavorful gravy… I’ll be making this dish again and again instead of saving it for a special holidays! I cooked 2 half turkey breasts which was plenty for 6 of us for dinner with enough leftovers to satisfy turkey sandwich and turkey noodle soup cravings. Remove skin from the turkey breast and pat skin dry. Cut it into 4 or 5 pieces. I like my kitchen shears for this. If you do not have a saute / brown feature on your slow-cooker, use a skillet set over medium heat and following the direction I have written for the slow-cooker browning feature. 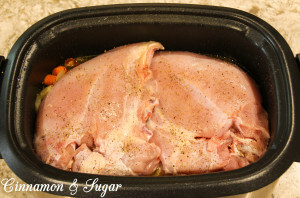 Heat the slow-cooker to 350 degrees on the browning feature and place turkey skin (skin side down) into the base. Cook until the skin is browned, turning over once, about 8 to 10 minutes. While the skin is browning, coarsely chop the onion, carrot, and celery. Add the vegetables to the turkey skin and cook an additional 10 minutes, stirring occasionally. If they begin browning too much, reduce heat. Add the garlic, 2 cups of chicken broth and the white wine to the vegetable mixture and stir. Season the turkey breast with salt and pepper. Add dried thyme and bay leaves then nestle the turkey into the broth mixture, rib side down. Cover and cook the turkey on low for 1-1/2 to 2 hours. The turkey will be done when it registers 160 degrees on an instant read thermometer. I suggest checking for doneness beginning at 1-1/2 hours. 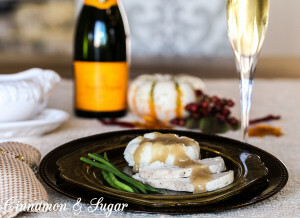 Remove turkey to a platter and cover with aluminum foil. Strain the broth and vegetable mixture through a fine-mesh strainer. 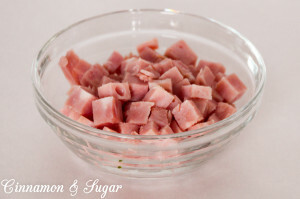 Discard solids and allow the fat to separate from the broth. Discard most of the fat and return the broth to your slow-cooker insert (if it has a saute feature) or to a medium-sized saucepan. 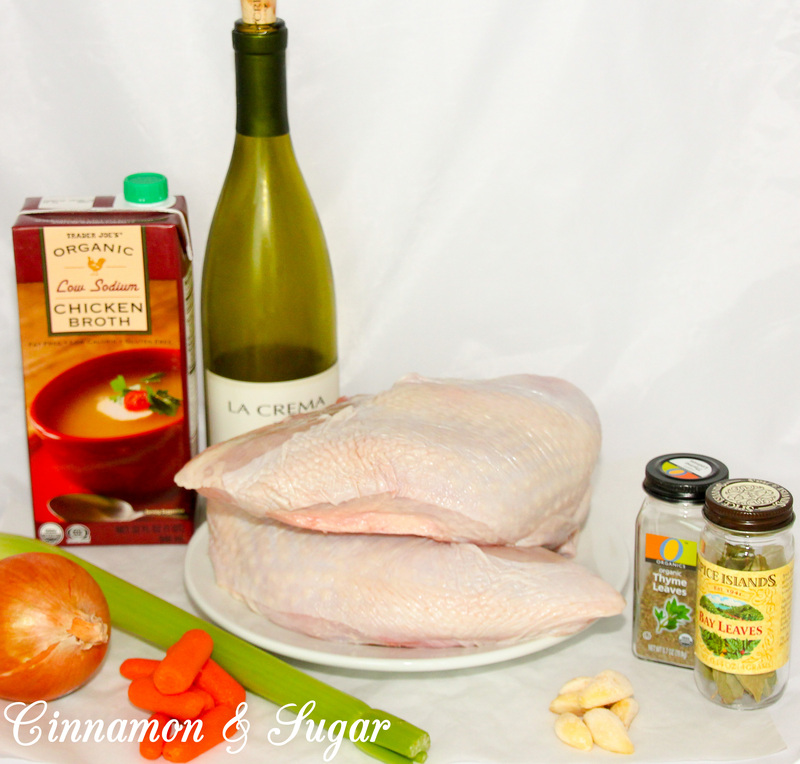 Mix the 4 tablespoons of cornstarch with 4 tablespoons chicken broth. Set aside. Heat the broth to a simmer then slowly whisk in the cornstarch mixture. Bring back to a simmer and cook 1 minute, until thickened, stirring constantly. 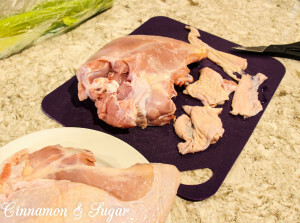 Remove the rib bones from the turkey breast and carve the meat. *If your slow cooker is large enough, you can cook 2 half turkey breasts at the same time. No need to increase the gravy ingredient amounts. Thanksgiving is a time of being thankful and remembering special people…. I chose to use my maternal grandmother’s hand crocheted tablecloth she gifted me 30+ years ago along with my paternal grandmother’s antique, depression glass plates and platter that she passed down to me.